When the nurses originally told us it would happen, Jon and I found it very difficult to believe. Really? Three pounds in a month, we questioned. But Nurse Susan assured us that the NICU folks are experts at fattening up children. Well, today the muppets hit five pounds. Chunksters! This past weekend the twins graduated to Newborn size diapers. This may or may not have had anything to do with growth. Diaper size increases are usually determined by the current diapers inability to contain poop. (Prior to having children I never imagined I would care so much about bodily functions.) The new diapers are much kinder to the boys increasingly expanding tummies. Last Friday, Jon noted that Destroy was beginning to look like a football – little arms and legs, big oversize midsection. Even more exciting is today’s development. 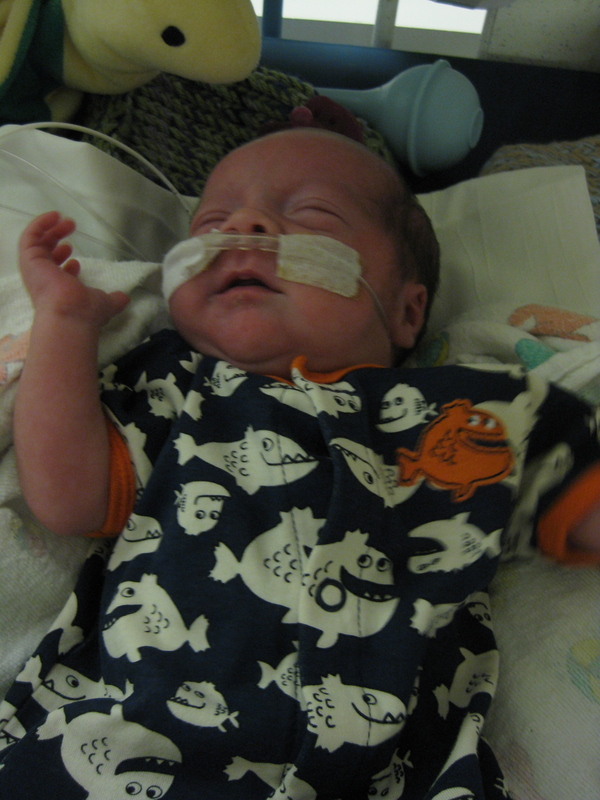 Along with the five-pound milestone, Search and Destroy no longer fit into their adorably tiny preemie size onesies. Their wardrobe options have just increased exponentially. 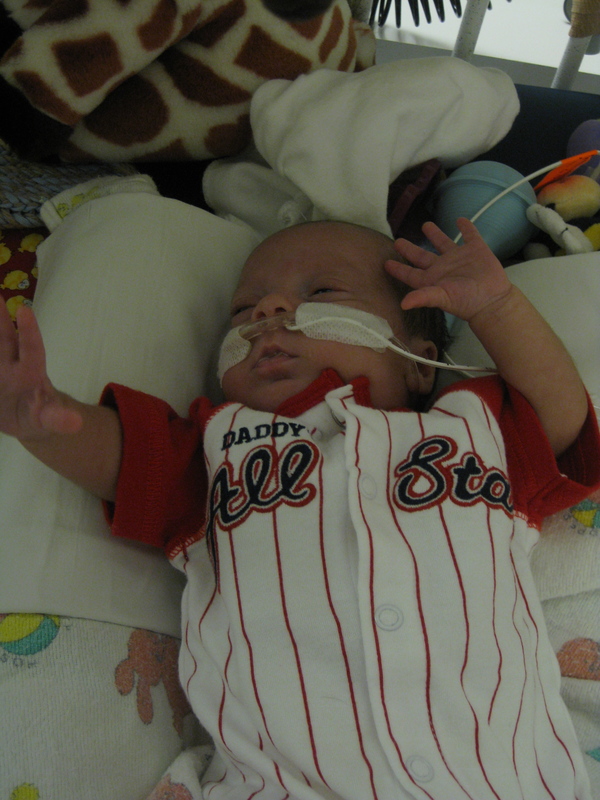 Destroy was clad in a standard issue hospital shirt – size 6 months – which is provided to all babies, from preemie to jumbo term size. He may as well have not been wearing anything for how big that shirt is. Search was still wearing his preemie outfit since he hadn’t yet spit up on it. But when the Nurse Susan arrived for her evening shift, she found Search squirming about with the bottom snaps not even closed. Perhaps Nurse Margaret thought he needed extra breathing room. Grow boys grow…grow boys grow!!!! he’s still saying how cute they are…and mimicking logan’s cry…little chipmunk!